Since our 2004 project was such a hit, we decided to stick with an elegant natural form for 2005. We chose to build a lotus blossom and were honored to win the local award for structural ingenutity for a second year running. The petals were made from canned bamboo shoots, the leaf consisted of cans of stuffed grape leaves. The pollen inside the blossom was made from bottles of yellow Vitamin Water. 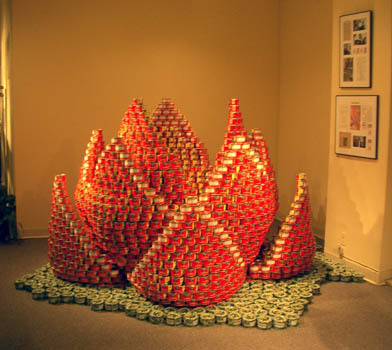 An image of the Lotus was used in all of the 2006 Canstruction promotional ads and postcards.